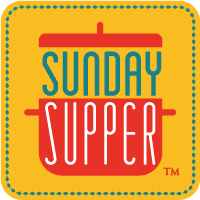 It’s Sunday Supper time again, and I have to say I am absolutely thrilled to have the opportunity to host this week’s event, which is all about Winter Salads. Salads are some of my favorites, especially when plated up as an entree. You can see I was a dedicated foodie, even at an early age. A snarky one at that! These days, we are so very blessed to have a global economy which affords us year-round availability of produce of all types. And while we marvel at buying locally grown produce at farm stands and markets during the summer, along with the abundance of our own home gardens, it will never be forgotten how good we have it these days. But in winter, we do remember that winter produce comes in from warm climates. And in this salad I have for you today, which is a Cobb Salad, the main produce will come from California, which is known for its avocados, and possibly Florida for the tomatoes, although I don’t doubt you can get California tomatoes as well. But east of the Mississippi, we rely on Florida for many things all year long, tomatoes among them. The Cobb salad itself hails from the Brown Derby restaurant in California, so having avocados in it is quite apropos. Also, for many years, Californians have generally been thought of as being leaders in the United States for health-conscious eating, with salads being one of the first things that come to mind when describing California-cuisine. Having a ready supply helps with that I suppose. As they don’t have to deal with copious amounts of snow and long, grey, dreary winters. But since we do have a global economy, this type of salad can be enjoyed by most people everywhere, all year long. And certainly will be enjoyed, as it is quite delicious! And while I am usually accustomed to providing a salad dressing recipe for every salad I post, I did use a fat-free blue cheese dressing for mine (I am on a diet right now), and you can use that flavor of dressing or make a red wine vinaigrette of your own. To do that, combine 1 part red wine vinegar with two parts extra virgin olive oil, add tsp Dijon mustard per each cruet, and season with salt and black pepper, maybe a pinch of garlic and/or sugar if you like, depending on your preferences. Whisk or shake until emulsified. Season chicken on both sides with salt, pepper and garlic powder. Cook chicken in a nonstick skillet until cooked through, 10-15 minutes, depending how thick or thin it is. Plate lettuce greens and top with salad toppings in a striped fashion. Serve salad with dressings of choice. Healthy Winter Salads to enjoy during even the coldest months. Yum! Your salad looks so delicious and I love the presentation too! I love, love, love Cobb salad, Sue. What an excellent choice, as you say, all year round! Cobb salad, Mmm I love it! That looks so delicious – I love the wooden plate! Sue, this recipe sounds divine. My friend, Karlene, was the first to tell me about Cobb Salad. It is a favorite of mine now! Hi Sue, I still remember sitting at the table too, long after dinner was over. Beautiful salad, perfect combination. Take care! Such a classic, looks great! LOVE Cobb Salads. Thanks again for hosting Sue. You did a great job. One of my fav salads! Thanks for hosting! The Florida tomatoes have been quite good this year! I love this salad any time of the year! Such a classic combination of textures and flavors! Thanks Renee! Tomatoes have been better overall in more recent years during winter! How can you go wrong with Avocado and Bacon? Love this!!! Thanks! It’s a favorite combination of mine too!